Our Gifts That Give Back (GTGB) tool offers charities the opportunity to create and manage virtual gift listings on your own. No matter the focus of your organization, our Gifts that Give Back tool will help you extend your reach and meet your fundraising goals by allowing you to offer virtual gifts that result in direct donations and increase awareness for your programs. A virtual gift is a great way to show a donor the impact their donation will have like a $20 donation helping St. Jude Children’s Research Hospital provide a “No more chemo party” for a child completing chemotherapy treatment or a $10 donation helping Direct Relief provide people impacted by disasters hygiene kits. The opportunities are limitless! For more examples of Gifts That Give Back on eBay visit www.ebay.com/gtgb. Before creating your first GTGB listing, we need to ensure a few housekeeping items are in order. Specifically, we want to check that your eBay and PayPal Giving Fund accounts are properly configured. 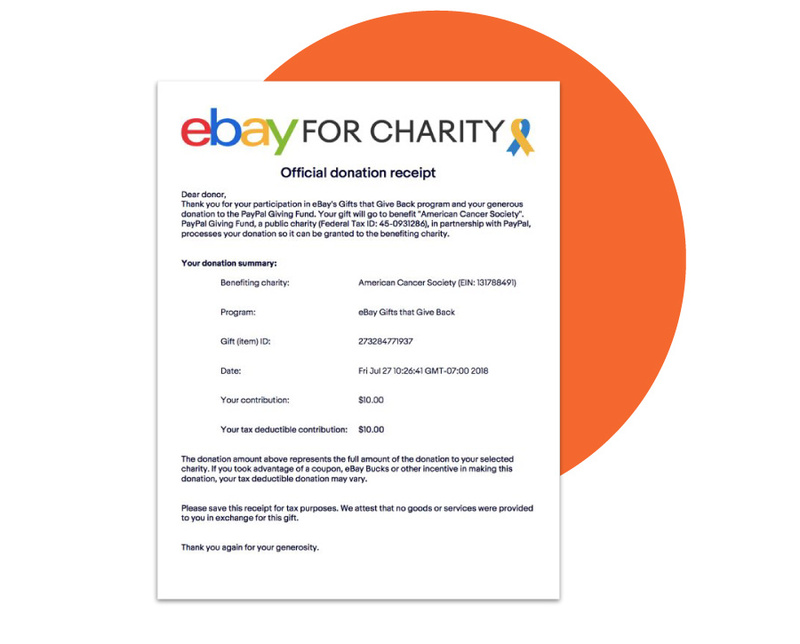 Does your charity have an eBay Seller Account? If not, no worries you can create one here. Is your eBay account configured as a Direct Seller? Yes, my account is a Direct Seller. Great! Let’s get started. No, it’s not a Direct Seller. To configure your account as a Direct Seller, we’ve created this Step-by-Step guide. Once your eBay account is set up as Direct Seller, you can then access the GTGB Tool to create and manage your own listings. 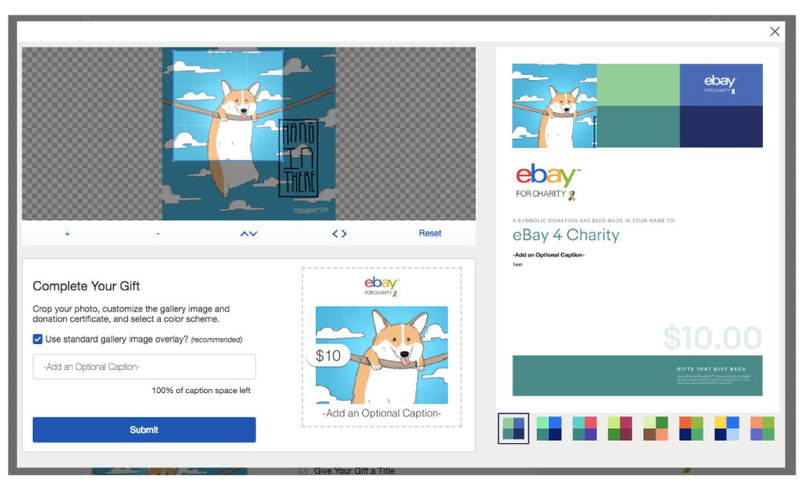 You can now create your own listings using eBay's Gift Creator. See the detailed steps below. As a Direct Seller for your organization, you’ve been automatically added to the Gift Creator. If your account has been configured to manage multiple organizations, you’ll see all of them in the “Select a Charity” dropdown. You can choose between Fixed Donations or Charitable Auctions. If choosing a Fixed Donation, you’ll need to specify the number of gifts available. The maximum number is 999. Use this section to describe your gift and provide the buyer with a description of the good they are doing in the world by purchasing your organization’s symbolic gift. Click here to view other GTGB listings. Please provide the PayPal account for your organization, this allows us to perform the proper checks to ensure the funds are routed to your charity. If you don’t know which account is associated with your charitable organization, please check with your Charity Administrator. To finish your GTGB listing, upload an image. This section also provides a checklist to ensure everything has been provided. After uploading your image and all of the check marks have turned green, select the “Preview Gift” button to finalize your GTGB listing. This is the final step in preparing your listing for submission. On this screen you’ll find a number of handy features for customizing the look and feel of your gift certificate. You can crop, flip, and rotate your image. You can provide additional copy which will appear under the listing’s image as well as changing the template color on the bottom right. When you feel your listing is ready to go live, select the “Submit” button. After a GTGB listing has sold, you can send the Gift Certificate and Donation Receipt. This is a perfect time to include any additional marketing materials you'd like to include. The buyer's address will be provided in your eBay Seller Hub. Visit the GTGB Home Page if you need a copy of your GTGB Gift Certificate and Donation Receipt. As part of the buyer's purchase process, they have been given the option of receiving a donation receipt for their purchase, since this may be used as a tax deduction as determined by their state. We recommend including a Donation Receipt with every purchase. 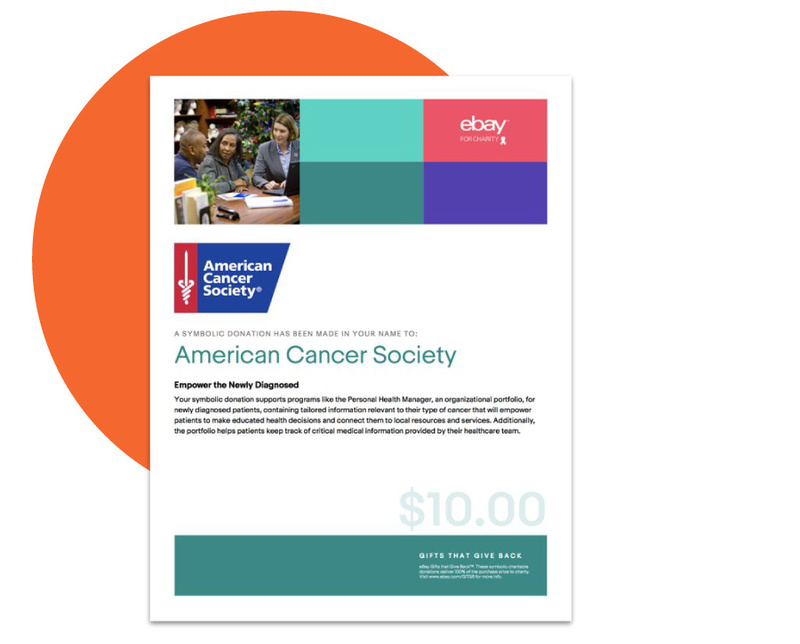 We personalize the eBay shopping and selling experience for all supporters that identify you as their favorite charity. Engage your supporters to sell items on eBay and donate a percentage of the profits to you. Leverage your celebrities, brands, and influencers to support you with unique experiences or one-of-a-kind auctions. As a charity, sell on eBay to expose your products to a massive community of 179 million active buyers…and we waive your fees. Enhance the way you merchandise your items through a dedicated eBay store. 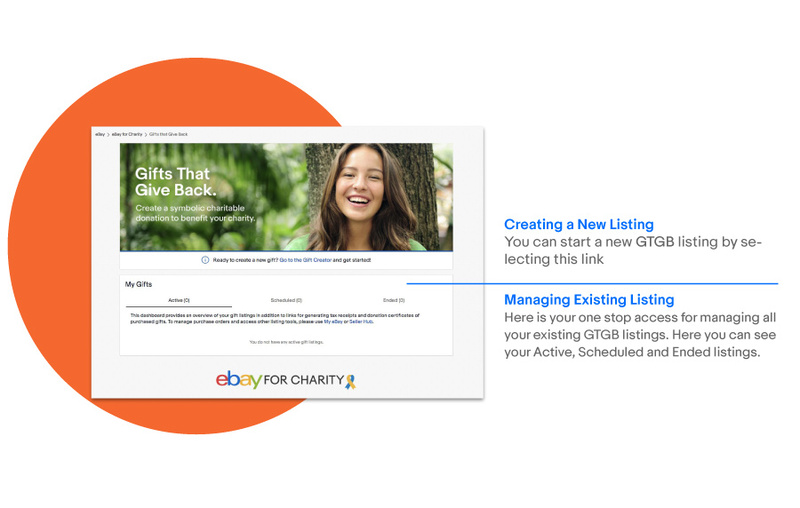 Display your charity brand throughout the eBay site and community of 179 million active buyers in our emails, social channels, and more. 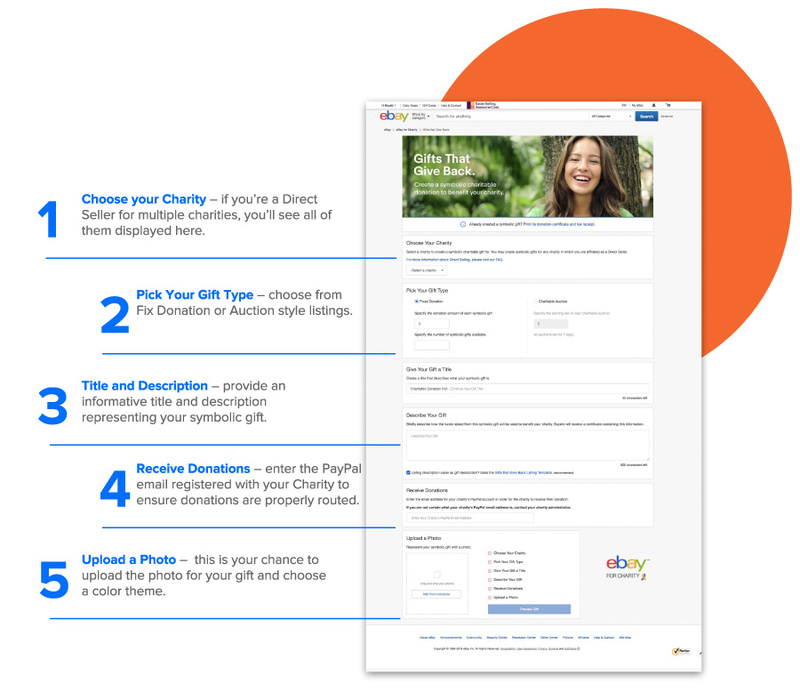 Sell symbolic donations in the eBay marketplace to our entire global community. Advertise on eBay with special packages designed just for charity organizations.